Hide the blizzard debuffs when BigDebuffs are displayed. Alternatively, you can redirect the blizzard debuffs to the BigDebuffs anchor. Always show special debuffs when BigDebuffs are displayed. 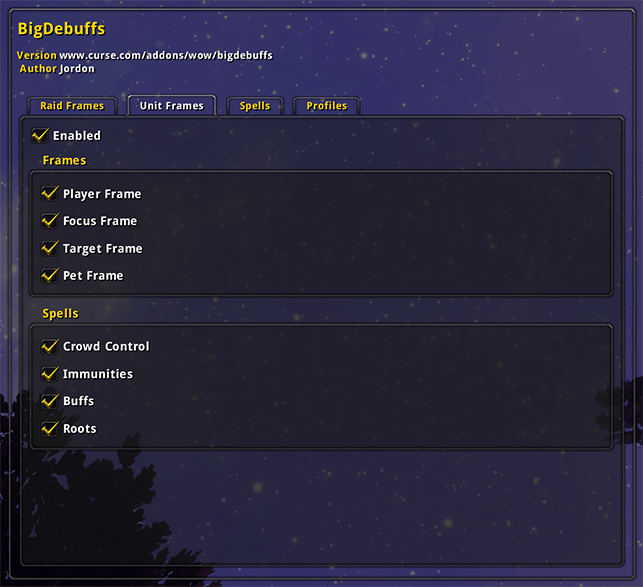 Create profiles for your BigDebuffs settings, including support for dual spec. Edited by Jordon, 23 June 2015 - 10:27 PM. I really like how big it shows the remaining time on the debuff as well. I'm sure it'll be extremely useful. Thanks, Jordon! This looks really sick, I used to use LoseControl next to raid frames but may ditch it for this. Thanks! Default raidframes without the basic features like being able to stay grouped without the horrible headers or grow upwards makes me cry. 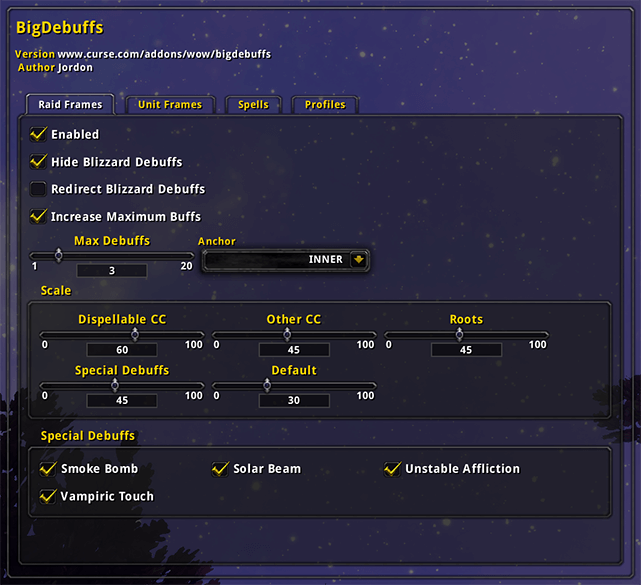 Great addon though as an alternative to Blizzard Raid Frame Indicators. It does what ArenaStyle already does very well. 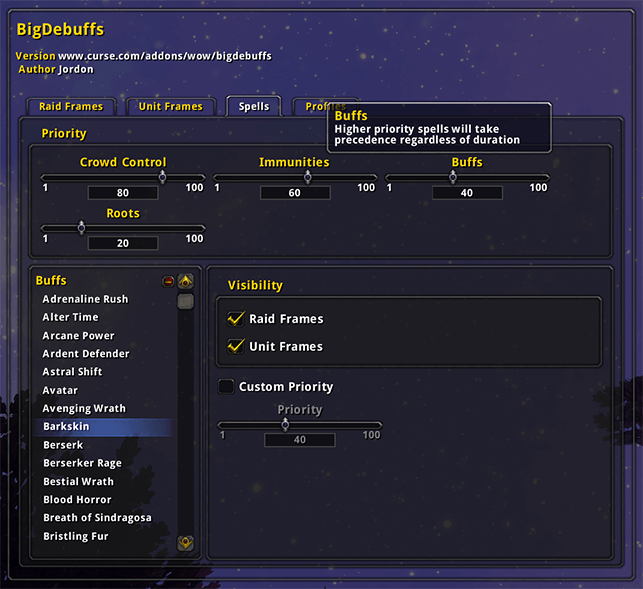 Also u can locate the buffs/cc on the right or left side outside the actual frame so its pretty much easier to see. Not discrediting your work tho - just presenting the alternative. Could it be a total replacement for ArenaStyle? Also its quite hard for Lose Control to work with raid frames, this addon does it! ps: does it work with ElvUI Raid Frame or with Grid addon? What would I have to change in the LUA to increase the scaling further? Never mind, it seems Arena Style conflicts with this. Disabled AS and it works great, thanks! Edited by Admoney, 25 October 2014 - 05:19 PM. That looks really sick since arenastyle doenst really works for me anymore. 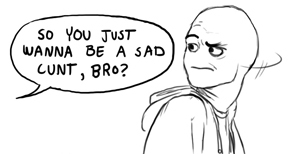 Hey Jordon can this addon be "compatible with the addon http://www.curse.com...wow/arenastyle" ? is there a way to increase more the debuff size? Updated for 6.2. Please see first post for updated information. Howewer doesn't work in Arena in combination wirh shadowed unit frames!